On Tuesday, we featured Hi Fashion's "Amazing" as our Song Of The Day. Today, we're spending Seven Questions In Heaven with the duo. HI FASHION is a electronic dance pop situation that will make you want to shake your body down to the floor. It's a big list and we both come from varied musical backgrounds. For Jen, it's Fugazi, Prince, Dee-Lite, Peaches, Grace Jones, and Debbie Harry just to name a few. For Rick, it's MIA, Eurythmics, Beastie Boys, Cut Copy, and Depeche Mode. But that's kinda only the beginning. Jen: I bought two at once. "Come On Eileen by Dexys Midnight Runners and Candy Girl by New Edition. That started me off. Rick: I got Standing On The Beach by The Cure and committed to growing my hair over my eyes. "Amazing" and its accompanying video are amazing! Who came up with the idea for the video? Did you design the costumes used in the video? Who did the choreography? THANK YOU!!! WE ARE SO HAPPY WITH IT!!! The video idea actually stemmed from our live show. 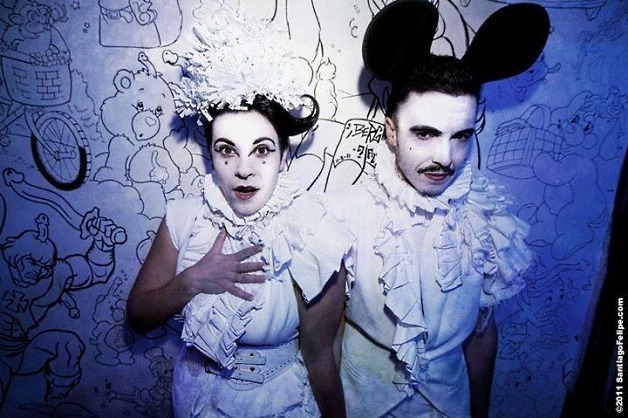 When we first released our EP Sprechen Sie Hi Fashion?, we did a Marie Antoinette theme at Mustache Mondays in Los Angeles. It took the song to a whole other place of decadence and the idea has haunted us ever since. We designed a lot of the costumes in the video but we also got incredible help from Briana Gonzalez, who styled Jen and made those insane beaded boots, and Kaycee Krieg, who fashioned the beautiful dancers' costumes. As always, the brilliant Danny Dolan did the choreography. He is an inextricable part of Hi Fashion since he choreographs everything we do. Including our daily routines (folding the laundry, dropping off the mail, vacuuming etc.). "Amazing" was also featured on Perez Hilton's album Pop Up! #1. How did that come about? I know it just came out last month, but has it helped your career yet? Perez has been a great fan from the very beginning. He has posted a lot of what we do and totally championed us. He approached us about being in his Pop Up! #1 and we were like, "DUH, OF COURSE." Let's just say that there are a lot of upcoming opportunities brewing at the moment and we are very thankful to him. You obviously have a great fashion sense. What other music acts do you feel have a great fashion style? Well first of all, we love Grace Jones. She's always insanely original and she knows how to make a whole song be about an outfit. In her show at the Hollywood Bowl, she wore one outfit per song. GENIUS. She's kind of the penultimate. We also love Grimes's nod to '90s fabulous, M.I.A and Brooke Candy's vicious street style, and Lady Gaga's permission to the world to wear a costume whenever you damn well please. This is the line up: Hi Fashion, Grace Jones, Dee-Lite, a DJ set by by Phyllis Diller, Prince, and Madonna with special guest stars The Golden Girls in their character costumes performing "Justify My Love." And then we die.